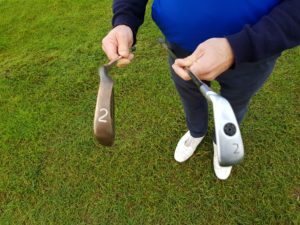 The following data is from two golfers testing the difference between a Ping Raptor 2 iron versus a Ping Eye 2 Beryllium Copper head. Both golfers are skilled players, one playing off a 5 handicap and the other is a PGA Golf Professional. The Beryllium copper ping eye 2 irons were introduced in 1982 and the copper head was branded one of golf’s all-time best selling irons. Extreme perimeter weighting & a unique sole design contributes to perimeter weighting promoting cleaner strikes. Preferred by a range of players to high-handicappers to PGA Golf Professionals all over. It is suggested that the metal Copper is ideal for players club-head hitting feedback. Benefits from 2013 Ping Raptor 2 iron. The shaft is 39.75-inch length with an 18-degree head. half an inch longer than a standard 2-iron shaft, resulting in more club-head speed and for longer distances. Also, Tungsten heel and toe weights adds to club-head speed. 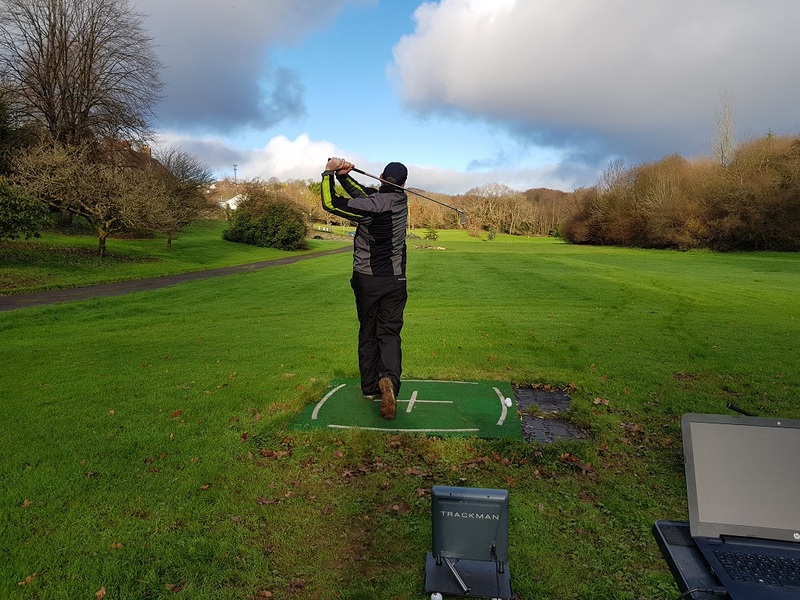 Corrispondately, the goal from this exercise was to simply compare Trackman data from hitting 5 shot off the mat and 5 shots off the tee with each club. Approx. 31 years is the difference between both the golf clubs release dates. 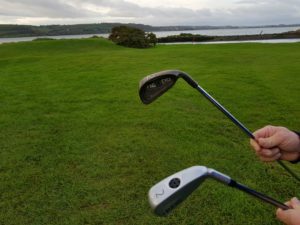 Truly, the fact that, the Ping Eye 2 can still perform compared to the Raptor 2 Iron is a testament to the quality golf clubs manufactured by Ping Golf. However, the raptor 2 iron is clearly a better option for both players. Notably, better ball speed, longer flight times and faster clubhead speeds. Clearly, a good club to use playing golf courses with lay-up shots and par 3s around 200 – 220 yards. Overall, I find the Ping Raptor 2 iron to be a really good performing club.